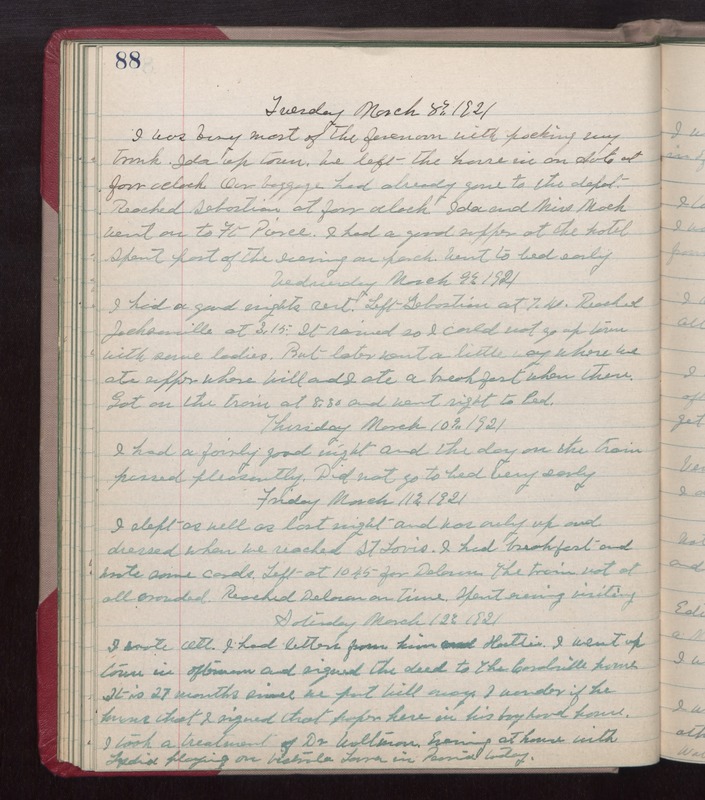 Tuesday March 8th 1921 I was busy most of the forenoon with packing my trunk. Ida up town. We left the house in an Auto at four oclock. Our baggage had already gone to the depot. Reached Sebastian at four oclock. Ida and Miss Mack went on the Ft Pierce. I had a good supper at the hotel. Spent part of the evening on porch. Went to bed early. Wednesday March 9th 1921 I had a good nights rest. Left Sebastian at 7.40. Reached Jacksonville at 3.15. It rained so I could not go up town with some ladies. But later went a little way where we ate supper where Will and I ate breakfast when there. Got on the train at 8.30 and went right to bed. Thursday March 10th 1921 I had a fairly good night and the day on the train passed pleasantly. Did not go to bed very early. Friday March 11th 1921 I slept as well as last night and was only up and dressed when we reached St Louis. I had breakfast and wrote some cards. Left at 10.45 for Delavan. The train not at all crowded. Reached Delavan on time. Spent evening visiting. Saturday March 12th 1921 I wrote Ott. I had letters from him and Hattie. I went up town in afternoon and signed the deed to The Coralville home. It is 27 months since we put Will away. I wonder if he knows that I signed that paper here in his boyhood house. I took a treatment of Dr Woltman. Evening at home with Lydia playing on Victrola. Laura in Peoria today.